About: The Rocket serve a selection of wines, beers and spirits as well as traditional pub food. Outside seating is provided on the pavement. They also have DJs playing the latest chart music and have karaoke nights. Pool tables, fruit machines and arcade games are provided. I went here after the England v Slovenia football game at Wembley and I enjoyed it so much here, I stayed there until 1am - What a great night !!! I was there with a friend and we both enjoyed the atmosphere and prices. The ESPN America sky channel was showing a college football game which I enjoyed too. The service was quite good considering some of the reports I had seen about the place. It was fairly full of younger people having a good night and enjoying themselves and there were no problems whatsoever. I am from the North of England and it was my first time in this pub, and if I ever get the chance again, I will be certainly visiting this pub for a pint or 6. Thanks to everyone concerned with this pub for a great night out !!! The Rocket has decent food, is very lively and offers a great selection of real ales. The service is patchy - I suspect it just depends on who is working at the time. They do have a large screen for sports, but I found it difficult to watch from anywhere other than standing at the bar (lots of smaller TVs though, so I suppose that makes up for it). The garden area has plenty of street seating, but not particularly private and I was asked to move last time as they were taking a beer delivery. Fair enough ! I'd stick to the inside which has some very sociable seating configurations. The patrons seem like a heady mix of lager swilling trendy students from UCL, journeying folk between St Pancras/Euston enjoying a Guinness and wine sipping office workers between 5-7pm. If you're after a few beers, meeting up with friends and one of the best Burgers on the Euston Road - then the Rocket should fit the bill for you. Watch out for your bags in the Rocket. Mine was nicked and I've heard of others who have lost bags as well. The staff/manager couldn't care less. Don't go here if you value your belongings. If you do make sure you keep an eye on them at all times. 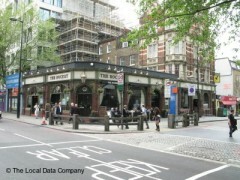 One of the busiest and lively bars in London. Near St. Pancreas Tube and in the delightful King's Cross area of London. As a twice-yearly visitor from the U.S., I always end up coming back to the King's Cross area, either to go pub-crawling, or to stay. Very friendly and lively area and the Rocket fits that description also.